I don't normally go much for diary-style entries, but it's been a busy weekend with some fun stuff happening, and it feels worth recording. We (me + Emma) went to a local comedy club The Stand with a couple of friends, proving once more that stand-up works a lot better live than on the TV. The Stand was running for years before I first went to it sometime in the middle of the decade. Note to self: go to more live comedy shows. Sunday night we spent watching Hal Duncan perform with a local psych-rock band called The Cosmic Dead, amongst other acts. Let me tell you, I really like the kind of stuff the Cosmic Dead do. You could probably sum them up in one word - Hawkwind - but that doesn't really do them justice. I find it eternally amusing that after having lived through the Eighties, an almost entirely execrable decade in terms of music, that the children of the same people who were buying Wham! or Smiths albums 25 years ago are now forming bands with names like The Cosmic Dead. Mind you, when Hal started shouting over the music ('reading poetry' I think is the technical term) I couldn't hear a damn thing. Also, everyone on the stage was completely invisible in clouds of dry ice. Lots and lots and lots of dry ice. On the other hand, it all added to the atmosphere, as did the fact the band themselves were dressed in black hooded capes. Given that it was Halloween this does make perfect sense, as does the fact the audience included Mexican wrestlers and a man painted blue. 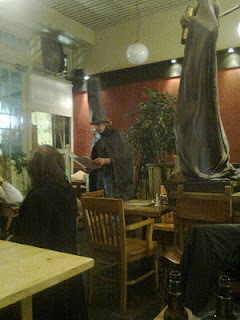 Monday and I checked out Word Dogs, which is a spoken word performance group including some members of the Glasgow SF Writer's Circle, in a city-centre cafe called Cafe Hula. Another interesting night, including seeing Jim Steel, Interzone's reviews editor, dressed in a three feet tall stovepipe hat. And it wasn't even Halloween. Unfortunately, when I arrived...I was the audience. Then someone else turned up and I pointed out the audience had just doubled (in fairness, a few other people eventually trickled in). And I somehow even managed to get some work done on the book in the middle of all this. I'm catching up on your blog and found this blog post. I agree Stand Up is MUCH better live! I remember going to The Stand when it was in the basement of the Tron Tavern here in Edinburgh when I was in my late teens. Ah, happy days. I used to know the staff and comedians back then. I miss it all. Might see who is up for a bit of stand up now that you've reminded me. Used to be a brilliant date venue as well - not that you'd be interested in that aspect! We have to wear pith helmets during British Summer Time. Even when we're indoors. It's ridiculous; I'm rapidly reaching the end of my tether.